This is the first of Ali Smith’s novels I’ve read, only having previously read some of her short stories in my final year at university for a Short Story module as part of the Creative Writing element of my degree. I remember reading Smith’s short story Writ which sees a middle-aged woman meet her 14 year old self (I believe it’s in the collection The First Person and Other Stories) and writing my own short story inspired by it. Ever since, Smith’s body of work has been one I’ve wanted to explore, but sadly I haven’t got around to it yet. But when I heard that her new novel How to be both was longlisted, and later shortlisted, for this year’s Man Booker Prize I immediately reserved a copy at my library. 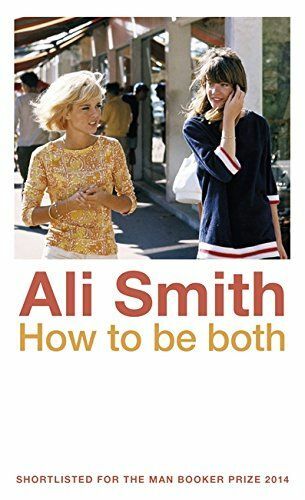 It’s been a while since I made that reservation – the queue was very long – but it was worth the wait and the novel has firmly cemented my desire to read more of Ali Smith’s work. I went into reading the book knowing very little – only that it focussed on two stories: one from a renaissance artist in the 1400s; the other a young girl named George in the modern day. I also knew that different versions of the book had been published: one with the artist’s story first; the other with George’s story first. Before I talk about the book, I think it’s important to mention that the copy I read had renaissance artist Francescho’s story first, followed by George’s. I think the idea of having two versions of the book published is a great concept and something I loved about the book before I’d even read it. Smith is truly playing with the form of the novel and the way we read in producing a book that can be read in multiple ways and may be experienced differently based simply on the version we happen to pick up. What I also like is that even though the version you read is based purely on chance, in theory you could also manipulate the version of the book you end up with by starting with the “second” story “first”. The concept also opens up many questions: does the order of the stories affect your perception of the book as a whole? Does it affect your perception of the characters? Do you notice/not notice certain elements due to the order of the stories? Do you interpret the novel differently based on whose story you read first? But there is no true order when it comes to these stories. Both link together, loop around each other, mirror each other. The looping means that the book is almost continuous – there’s no set beginning or end. How to be both is a book of duality – in terms of the stories, in their themes, in their questions, and in the characters. And I think this means that it doesn’t matter whose story you read first, but you do need to read one in order to fully appreciate the other. Something I do know is that I want to reread this book. The mirroring of the two stories means that I’m sure there are small moments, little hints here and there, throughout both sections that I’ve missed which make this book even more brilliant than I first thought. And How to be both is a brilliant book. It’s taken remarkable skill to pull off a book as complex and as full of ideas as this, yet still manage to keep it accessible. It’s intellectual, but playful. I found George’s section in particular to be very thought-provoking when she recounts memories of her mother and her ideas and questions about art, morals, time, truth, life and death. It certainly got me thinking and the ideas expressed or raised in the book are definitely worth exploring further. While I enjoyed the book, I did struggle with it at first and I don’t know whether it’s because Francescho’s story didn’t grab me or a difficulty with the novel’s style. The style is very impressionistic and fluid – slipping from moment to moment – energetic, and powerful. But once I’d got used to this, I found the prose kept carrying me along until I was brought right into the stories. There are no chapter breaks and there can be pages at a time with no paragraphs, but this means that the flow, pace, and momentum of the book is never interrupted. Instead, it continued to pull me in and push me along until I easily lost time in this book. How to be both is a clever novel which intertwines stories spanning hundreds of years and encompasses human life in the stories of two people. While I don’t necessarily feel heavily invested in the characters, I greatly admire what Smith has done with How to be both. It’s a clever and complex, yet accessible, book which plays with the form of a novel. I have only skim read this as I am just over 1/2 through atm . My version is also Franchesco first …but I have been wondering if it might have been better with George first, I certainly am finding that narrative more engaging. A reread is almost a must I think …already I can sense there are so many links and connections I have missed . Brilliant novel ……I will reread your review in detail once I’ve finished. Would love to know what you think of it once you’ve finished! Can’t wait to read this – I love Smith’s writing. But I’m on a self-imposed book-buying ban at the moment so I will follow your lead & reserve at the library, it sounds great! I’m planning to read this one over Christmas, so I’m trying to avoid reading any reviews before then – sorry, Gemma! I can see from Helen’s comment that your copy starts with Francesco’s narrative – I think my version is the same so it’ll be interesting to see how it works. I really want to read this book – I love the idea of two versions of the same book, and not knowing which one you are going to get (if you order it online…). Great review, Gemma. The concept is fascinating, isn’t it? I really like the way you’ve articulated the questions it raised in your mind. I think I’d also like to reread this novel at some stage, perhaps in the opposite order to my original reading just to see whether it makes a difference. At first I thought my copy started with Francescho, but I was mistaken as it started with Greorge. I thoroughly enjoyed both sections, but Francescho was my favourite…just something about the originality of her voice. I love what you say about the mirroring and looping throughout the book. I’m sure I missed some of those connections along the way (which makes the prospect of a reread all the more attractive). It’s a novel full of intriguing ideas, isn’t it, and yet it never feels crowded or too smart for its own good. That’s quite an achievement. Thank you Jacqui 🙂 A reread is definitely in order for me and, like you say, I might try reading it the other way around. I agree, it’s a remarkable achievement.